All set for families and lots of great memories. Located in the beautiful Cherry Grove Section of North Myrtle Beach all this gorgeous newly constructed ocean front home needs is you. This luxurious beach home boasts a private pool, 2 wet bars, 6 bedrooms – each with a cable TV and DVD player, plus a large flat screen in both the great room and game room. Don’t forget the pool table and video games in the game room! 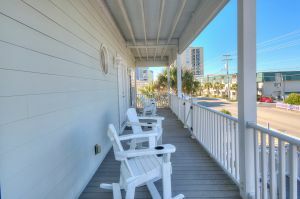 If spending time on the two covered porches rocking to the setting sun is your idea of heaven, then Sea Glass in North Myrtle Beach is the vacation home rental for you! At Sea Glass, all these options are at your fingertips and even more amusements and attractions are around the corner from this North Myrtle Beach vacation rental. 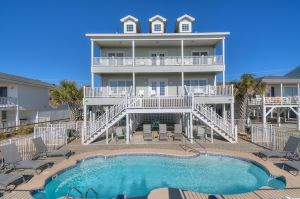 Call us today at 1-800-525-0225 or visit our website www.northmyrtlebeachtravel.com to book this beautiful vacation rental for your summer vacation.